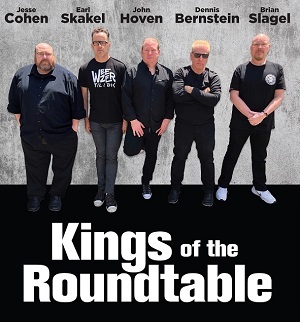 • With a bevy of NHL brass, including the commissioner, in NoCal this weekend for the league’s annual talent showcase, you can also expect several key announcements related to next season and beyond. As we first reported back in June, all signs point to the Kings playing games in Europe next season. We’ve been told an announcement by Gary Bettmann should come as early as Friday. Hearing continued chatter about the LA Kings playing regular season games in Europe next season. Of course, AEG has arenas in Sweden and Germany. However, one country mentioned a few times has been the Czech Republic. Interesting. • Staying in San Jose, it’s easy to understand why the league would want Drew Doughty there to represent the Kings. After all, he’s arguably the best defenseman on the planet and he’s quite the character. Now, if you want to talk about which Kings player deserves to be there the most, there’s no doubt that should have been Dustin Brown. Taking the season as a whole – and it’s been a dreadful season for all involved – the former captain has been LA’s best player. Last season was a bit of redemption for the former first round pick. Shown confidence by his coach, Brown produced the way Brown can. As we’ve stated man times before, he didn’t start playing better, he started being used better. Those are two different concepts. Regardless, you saw it again at the start of this season. When Brown missed 10 games to begin the year, it was obvious what a difference the Kings are with him in the lineup versus without. From everything we’ve been told, he is one of the few Kings who will not be available during the team’s upcoming roster makeover. He should retire a King someday and management seems to agree. The leadership he has shown this season has not gone unnoticed either. It’s not about what letter he has on his jersey. It’s about letting it be known that he isn’t happy with the team’s performance and will not tolerate any further erosion of the winning culture he helped bring to Los Angeles. Dustin Brown, leader to the core; leader of the core. • For the Kings to fix their current ailments, one of the things they’ll need from the next crop of players to infiltrate their lineup are a few good character guys. 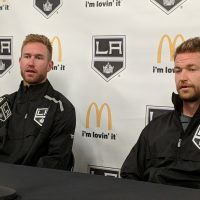 We’ve often referenced this article – which includes quotes from all the key LA management folks – and it’s points to what’s been missing since the departure of guys like Matt Greene, Willie Mitchell, and Jarret Stoll. If you don’t understand the importance of Kyle Clifford yet, and why he will likely never be traded, you need to read this article here. Why reference those two articles right now? 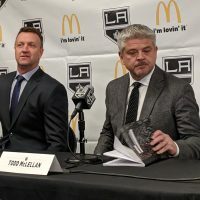 Because (a) it’s critical to understanding today’s LA Kings and (b) there is a prospect coming up next season who could be the first piece of the next character wave. Try and guess who it is. We’ll reveal the answer next week when our annual midseason prospect rankings roll out. Hint: This player is Mike Ricci-esque. Look him up if you’re not familiar. He played over 1,000 games in the NHL, scored 20 goals six times, and was a consummate glue guy. It’s fairly common for an organization to be the road team the year before hosting their own game. With the Raiders new Las Vegas stadium scheduled to open in summer of 2020, playing a game there in early 2021 shouldn’t be an issue. And if I’m the NHL, I want a game in that stadium as soon as possible for two main reasons. One, it strengthens the argument for expansion (the VGK franchise has done well thus far and you want to keep that money train rolling). Two, it further demonstrates to the world that Vegas is a hockey town when you can show pics and video of 65,000 fans at a hockey game in Sin City – a point you want to drive home to the locals even more, dissuading them from jumping ship and diverting entertainment dollars to the just-moved-in Raiders. This might be looking too far ahead, but you could line things up as follows: Golden Knights at Avalanche next season, followed by Vegas hosting the Kings the following year (2020-21), then the rematch in LA’s new football stadium in 2021-22. Since it looks like the NHL will be announcing the Kings v Avs matchup fairly soon here, perhaps all parties can slightly twist our idea and end up with a very similar outcome. Go with Kings/Avs next season, then have Los Angeles host the Golden Knights in 2020-21, followed by a rematch in Vegas in 2021-22. Everybody just better hope that Raider nation hasn’t taken over by then. While at first I was suspect about the Kings playing in Europe and in an outdoor game during the same season, one hockey exec was quick to point out to me that Ottawa did the double in 2017. • Sticking to the business side for just a minute, let’s talk jerseys. Some Kings fans voiced their displeasure over the team’s new silver jersey. Sure, you can’t please all the people all the time. However, the main gripe seems to be the lack of color. However, people seem to forget – the team’s colors are black, white, and silver. Purple is not part of the team’s current color palette. Jersey sales also had something to do with this. The Kings have released purple (aka forum blue) and gold jerseys in recent years, as part of the Legends Nights events. From the intel we’ve gathered, the silver jerseys used for the outdoor games in 2014 and 2015. Just do a little test yourself, next time you’re at Staples Center, look around and count the number of purple/gold jerseys you see and compare that to the number of silver jerseys. Fans can say whatever they want on social media, but the real test is how the masses spend their money. Hence, silver won out when creating this new permanent addition to the team’s jersey offerings. This silver edition is not a specialty jersey. The team views it as they now have three full-time sweaters in their rotation – and all three support the team’s brand. Fret not, though, longtime Kings fans wanting to see more purple. The Kings will continue to use what we’ll call heritage jerseys for those Legends Nights (i.e. era specific jerseys, the 1967 version, the Gretzky version, etc.). Further, building off of the paragraph above, an outdoor game would also give the team a chance to create a unique one-off jersey in the near future. • Trades, trades, trades. That seems like all anybody wants to talk about these days – so here goes the latest. It appears Tyler Toffoli is safe for now. After previously exploring moving him earlier this season, the latest round of intel we’ve gathered suggests the Kings are now planning to keep the 26-year-old forward… for at least another year. 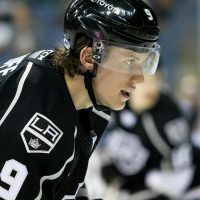 In short, combined with his low trade value and their desire to see what he’ll do under a new coach next season, Toffoli will most likely stay in a Kings uniform. He’ll be on a short leash, no doubt. Coming off his 31 goal season in 2015-16, that was what the Kings expected annually going forward. When he followed up that campaign with 16 goals in 63 games (which projects to roughly 21 goals over a full season), it was excused away as largely related to an injury, and perhaps a new coach would get him back on track. With 24 goals last season and likely nowhere near that number this season, Toffoli is once again surrounded by questions. In a perfect world, everything lines up nicely for him though. Next season is a contract year, the last of his current three-year deal at $4.6M per, and under a new coach next season, he should be seeing plenty of playing time to get back on tract. 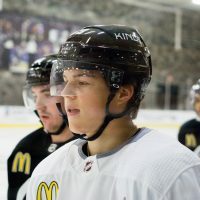 The Kings will then be faced with a tough decision one year from now – sign him to an extension or move him at the 2020 Trade Deadline for future assets. • Privately, I’ve had an interesting debate with several in the hockey world over the past few weeks – Could the Kings possibly get a first round pick when trading Jeff Carter? I say no, and the general consensus seems to be split down the middle. Many arguing ‘yes’ seem to point to the Boston deal for Rick Nash. However, all deals aren’t created equally, with age and offensive production being just two of the elements to consider. There’s also cap room. Sure, Carter has a relatively manageable cap situation (he comes with three years left on his deal, carrying a total of 15M in cap space, but only 7M in actual cash owed, as the deal was front loaded). If a team was willing to give up a first round pick for Carter (or a package that includes, say, Carter and a prospect), would that change Rob Blake’s plan at all… would he possibly consider keeping Jake Muzzin? Considering how difficult it is to build a solid defense, and with the Kings seemingly deeper in the offensive side of the prospect pool, If I could get a first for Carter, I’d keep Muzzin. If you can’t get a first for Carter, you trade Muzzin because the general belief is only Muzzin and Jonathan Quick are going to yield the Kings first round picks in return. Now stay with me here… the Kings need to acquire at least two first round picks in their upcoming trades. Here’s the challenge – if everything fell perfectly, you’d want two first rounders this June (yours and one acquired in a deal) and then two first rounders in 2020, where the draft is expected to be a little deeper for forwards. The key to all of this is getting the second first rounder this year. That must happen to accelerate the timing of the roster makeover. You don’t want to trade guys now with all the key picks coming back not activated until the 2020 draft (that unnecessarily delays things). This is why the upcoming trades of the Kings vets are so critical. It all comes down to lining the dominoes up correctly. We’ll assume the deal for Quick likely won’t come until the summer. Which means, the Kings are most likely looking at Carter and/or Muzzin deals before the trade deadline. Muzzin should have more value (we’ve said for months the expectation is a first round pick plus a second asset, either a second rounder/prospect). If you, somehow, can move Carter for a first round pick in 2019, that gives Blake more creativity with other trades. If Carter won’t net a first, then the choice is obvious, move Muzzin for a first round pick. In the end, we still expect Carter, Lewis, Martinez, and Quick to be dealt off the Kings roster by June 22nd. Muzzin is a bit of an x-factor in everything because you really don’t have to trade him… if you can get the first rounder for Carter. • If you really want to think of a fun idea, see Larry Brooks’ recent column in New York, he was daydreaming about the Islanders making a play for both Muzzin and Martinez. That’s an interesting thought, indeed. • Hoping for a few thoughts from our recent trip to Vancouver for the World Junior Championships? One important thing to keep in mind, the tournament isn’t really designed to showcase draft eligible players, making it hard to get a good read on Jack Hughes, Kaapo Kakko, etc. The latter certainly was impressive; however, he also played a bigger role for his team than Hughes did with Team USA. Both are expected to be the top two selections at the NHL Draft in June, with Hughes being the clear cut No. 1. From the scouts we spoke with, it sounded like there was a clear drop off to No. 3 and for the next five picks after that, you’re likely dealing with preference more than anything else. Among the Kings prospects that participated in the tournament, high marks have to be given to Markus Phillips (who went from an afterthought among Team Canada’s summer camp invitees to being one-half of their top defensive pair just a few months later) and USA captain Mikey Anderson, who looked every bit of the real deal. We’ll have more on both when we start rolling out our latest LA Kings Prospect Rankings next week. • Finally, for some reason, people still hit us up about the Kings coaching situation. No, Willie Desjardins will not be back next season. He is not the coach of the Kings, he is the interim coach. It’s an important distinction. Think of it like a babysitter. And, yes, bringing him in early November did make sense at the time. 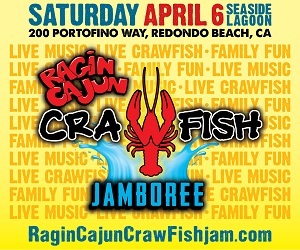 We broke it all down here last week. Characterizing it as a mistake by Blake isn’t fully accurate. Looking at the standings on that date, the Kings still had a shot. When it was determined John Stevens needed to go in order to give the team their best chance at climbing back into the playoff race, the team had limited options. For those who keep asking, why didn’t they hire Joel Quenneville? Simple; he was still employed at the time. Why not Ken Hitchcock? We’ll assume it was easier to get him out of retirement to work with Connor McDavid than it would have been to motivate him with the current LA roster. Regardless, in the big picture, it’s probably a good thing it’s worked out this way for the Kings. The current roster isn’t primed for a deep playoff run. A makeover is in order. Who is coaching today is irrelevant in the big picture. The next coach is the key to all of this. In many ways, he’s even more important the draft picks Blake will be acquiring next month. The next coach will be the bridge back to the playoffs. He’ll be the keeper of the new talent – i.e. Rasmus Kupari, Jaret Anderson-Dolan, Kale Clauge, etc. If the wrong guy is hired, instead of re-establishing the winning culture in Los Angeles, that coach will be the final eraser to everything built over the past decade. Then, the Kings truly would be starting from square one. Confident that we ask the questions that need to be asked… and that our content over the past 10 years is top shelf. 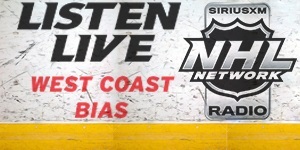 MM is THE source for LA Kings breaking news and information. Appreciate the support. Thank you. Oh man it will be sad to see some of these boys who won in 2012 and 2014 go, even though it is necessary. End of an era in a way. Also, not that the team will get anything significant back, but its worth looking at trading Hagelin, Budaj, and/or Thompson purely because they are almost definitely not going to be resigned and something is better than nothing. Maybe they get packaged alongside Carter and/or Muzzin.